Official Navy photo postcard of the U.S.S. West Virginia at sea. 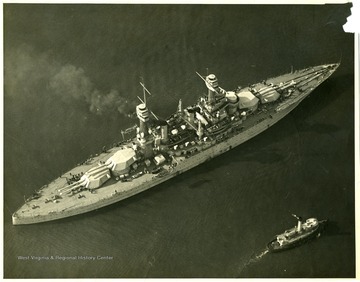 Postcard of the U.S.S. West Virginia at sea outside of a city. The photograph was taken before 1941. 3. U.S.S. 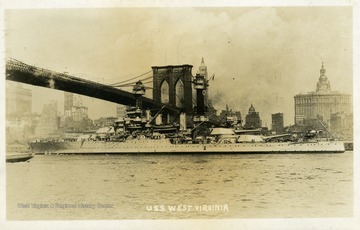 West Virginia Passes Under the Brooklyn Bridge, Ny. The U.S.S. 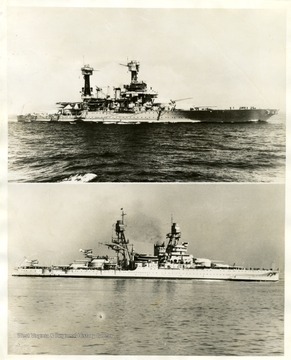 West Virginia and USS Oklahoma at sea. 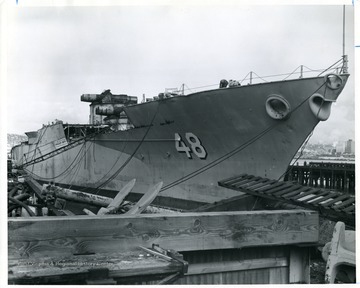 Text on back reads 'Official U.S. Navy photographs from C941635...Watch your credit...international news photos slug West Virginia-Oklahoma' U.S. Battleships bombed by Japs. Washington, D.C...Two U.S. Warships, the Battleships West Virginia 'Top' and Oklahoma 'Bottom', were reported damaged or sunk in the Japanese bombing attack on the Pearl Harbor, Hawaii Naval Base. G-12-7-41-9/30PM. U.S.S. 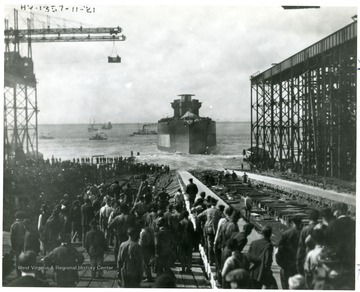 West Virginia leaving dry docks with a crowd of onlookers. Picture of the Mast of the U.S.S. 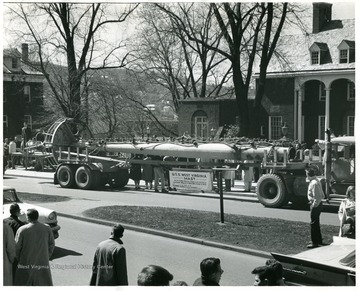 West Virginia pictured in front of Elizabeth Moore Hall at Friday noon, March 17, 1961. 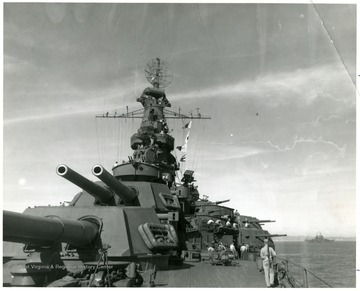 Picture of the guns of the U.S.S. 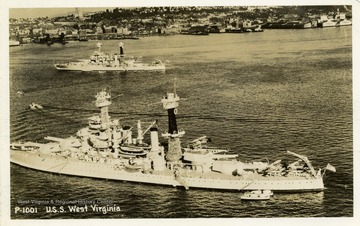 West Virginia 'BB-48'. 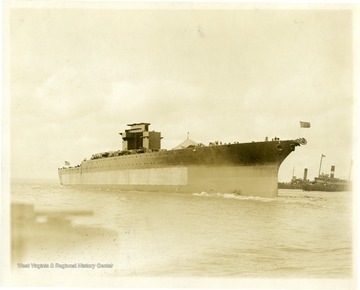 Credit Line, Navy Department, photo no. 80-G-3 39585. 8. U.S.S. 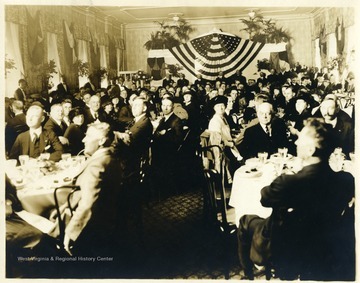 West Virginia after Launch, Newport News, Va.
Men and women dining in celebration of the U.S.S. West Virginia. Taken at Hampton Roads Va. Photo of the U.S.S. 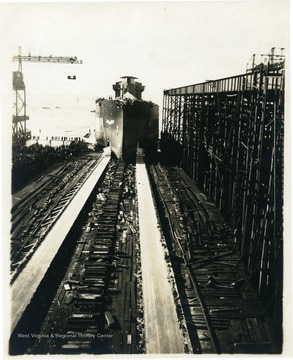 West Virginia taken after launching. Credit Line: Navy Department photo no. 80-CF-2058-2 in National Archives. The U.S.S. West Virginia next to another much smaller boat. Stamped on back: Official photograph. Not to be used for publication by order of the Chief of the Bureau of Aeronautics. 12. U.S.S. West Virginia Being Scrapped - Todd Shipyards, Seattle, Wa. U.S.S. West Virginia Being Scrapped - Todd Shipyards, Seattle, Wa.